Dear Grandparenting: One of the most nervous things for grandparents is watching how your grandkids fit in socially. Whom do they hang around with? Are they popular? Do they care about being popular? This is not some piddling matter. Nothing matters more to my grandkids than their friends. Friends define their world. It starts pretty early. Before my grandkids were even teenagers they had their special group of friends. It makes me nervous to think how much these friends influence what my grandkids will do and what they think of themselves. Will they curl up and die if rejected by the “cool” kids? Will they stay to themselves and get bullied and picked on? Dear Louise: It’s no secret the great majority of grandchildren endeavor to fit in with a certain social group at some point in their young lives. And that’s a good thing. Friendships play an essential role in their growth and maturation. 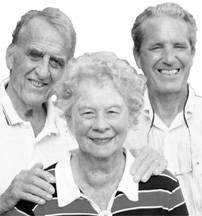 Companions help grandchildren gain self-esteem by seeing themselves as more likeable and are allies that help them cope. Friends help grandchildren develop empathy for others and lead to learning interpersonal skills like negotiation and working through disagreements. One researcher concluded there are four general cliques or friendship groups that adolescents can join: the popular group, the “wannabe” group, the mid-level friendship group (largest of all) and the isolated group. Girls are especially likely to conform to the pressures of their social circle. But the boundaries of what’s considered “cool” or makes one popular are fluid, and not every grandchild seeks a special social status. Cool kids are as likely as anyone to be bullied and often engage in risky, self-destructive behavior. There’s no doubt your grandchildren’s close acquaintances influence their development. But in the end, it comes down to you and other adult family members according to prominent developmental psychologist Eric Erickson. As teens begin to discover their true self-identity during adolescence, they come to rely more on how they’re perceived by significant family adults, such as grandparents. Seems you will have plenty to say about how your grandchildren turn out after all. Andrew York, of Cape May, New Jersey, sometimes allows grandson Mack to pound away on his old typewriter.